Another TNT (Taucher.net Treffen = Taucher.net dive meeting)! Ever since the first one at Lake Constance these twice yearly meetings have served the purpose of giving the people who chat and discuss things online at www.taucher.net the chance of getting to know each other in the real world and go diving together. 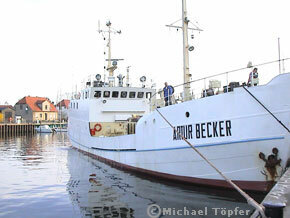 For the eigth TNT Jan had organised something really special: a wreck dive cruise aboard the MS Artur Becker. The arrangements were made through Michael, a member of the Greifswald Dive Club which owns the ship. As the home port of the MS Artur Becker is Greifswald, a town on the Baltic Sea in the far north-east of Germany, several teams competed for the title of longest journey. Points of origin were, among others: Zurich, Attersee (Austria) and Leeds. The winner was Viktor from Bratislava (Slovakia). He was, however, disqualified on the third day, when he told us that he had never heard of the Taucher.net and had only booked the last remaining place which was advertised on the ship's website by chance! After the rain on the way up, the weather seemed promising to us landlubbers. Blue sky and the sun shining on the Artur Becker mooring at its berth. Horst, the ship's machinist, welcomed us aboard and gave us a brief tour of the ship. As one of the first to arrive I had the privilege of chosing my bunk. The Artur Becker, originally built as a lugger, has two cabins for twelve guests each. They function not only as rooms to sleep in, but also as lounge and mess room. Having an initial glance round the cabin, we only saw two power outlets - definitely not enough for all our diving lamps, cameras and laptops. A multi plug became an item of our shopping list for the next day. Together with Klaus, Regine, Michael and his girl friend Sandra, my buddy Jessica and I went to a Greek restaurant for dinner and started exchanging anecdotes - not only about diving, but also about dentistry (Michael being a dentist)! When we returned to the Artur Becker, Anke and Brian from Leeds had arrived. Jan and his buddy arrived in the middle of the night (at about 3 a.m.) and chose the other cabin, so giving me a night's undisturbed sleep.